Experience: 8 years Research and Apprenticeship, 22 years delivering public interpretive presentations and demonstrations, 23 years professional practice full time. 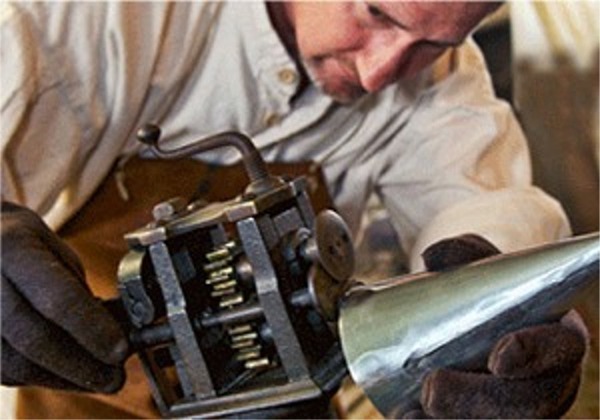 Having amassed many actual period hand and mechanical tools of the Tin-smiths Trade, he has conducted many professional educational event demonstrations for the public. Most noted is his annual association with the Dixie Classic Fair, in Winston-Salem NC beginning in 1994 to the present. “Michael Felk has provided tinsmithing demonstrations at the Dixie Classic Fair’s Yesterday Village for over a decade and continues to draw strong crowds. His knowledge and personality draws fair goers in and keeps them entertained while educating them on the craft of making practical and beautiful tin products. He recently has worked with us to sell items made during the Fair, offsetting the cost of his demonstrations”. Performances Survey Form- Proved to attract visitors and was considered to by dynamic, enriching, cultural, and educational with no changes required. Audience participation was given with interaction for all ages especially the shool aged. Proved to enhance overall event offerings. Cost for this entertainment was found to be commensurate with services provided. Tour of Exhibits, Mining to 18th Century Plating, Daily Living Archives produced their History and Use, 1st Level Game– "What am I making" with clue provided to audience, 2nd Level Game– Mystery Case Triple Guess Challenge, Winners circle with applause, Audience questions with supervised participation, includes 30minute carry over! Annually these shows include continuous upgrades as reflected in the never before seen oddities or period contrivances included inside the "Mystery Living Archives Case". These rare contrivances sample actual reproductions of 18th to 19th centuries, covering domestic, agriculture, military and medical devices used daily though since have disappeared.